Tea Stories: Tea History, Tea Legends, Tea Spreads. The story of tea (its plant is called "Camellia sinensis" in scientific name, which is originated from Latin, Camellia means 'tea' and sinensis means 'China' in English. ) 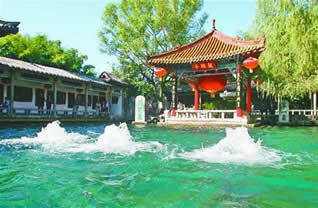 began in ancient China about 2737 B.C. 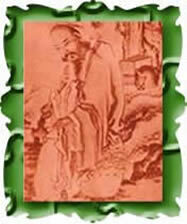 One day, Shen Nong, the Chinese Divine Cultivator was sitting beneath a tree to boil a pot of drinking water. Accidentally some dried leaves from the tree blew and fell into the water. A brown liquid was infused into the water. He was curious about the new liquid, decided to try the infusion. Shen Nong shortly found the liquid very refreshing with a pleasant fragrance. Thus as a herbalist he began his fascinating search to identify and classify tea variety and quality. There is another legend saying that as an experimental herbalist Shen Nong sampled various kinds of plants to determine their individual effects. This boldness sometimes resulted in poisoning and he used tea as an antidote. From his discovery tea as is known worldwide now has become part of the lifestyle of many nations. It has become a general beverage in every corner or the world today. A legend of a much later date about A.D. 520 concerns about Chinese Zen Buddhism. The emperor gave Zen a cave-temple, where he proceeded to demonstrate the benefits of meditation. Just staring at a wall for his years' meditation, he often fell asleep. To make sure that his eyelids did not drop again, he cut them off and cast them away. Where they fell a plant grew, the tea plant, from whose leaves a drink can be prepared which drives away sleep. The aid of tea during long hours of meditation may indeed explain how monks became instrumental in spreading its fame. Later Zen monks took to honoring their founder by sipping tea before a statue of him. During the fifth century, tea drinking spread rapidly in the south and more slowly in the north. By then tea was well established as a beverage. A Jin dynasty poet wrote, "Fragrant tea superimposes the six passions; the taste for it spreads over the nine districts (meaning the whole country)." Tea was sent to the emperors of the Eastern Jin dynasty tribes, for Chinese records note its use in barter trade with Turkic peoples in A.D. 476. In the far reaches, tea compressed into cakes or bricks served as a medium of exchange almost from the beginning of the tea trade. Tea bricks continued in this role even after paper money was introduced in the eleventh century. Tea merchants were responsible for the first bank drafts in the Tang dynasty. They found it difficult and dangerous to carry the gold payment for their sales back to the south from the capital Chang'an (today's Xi'an). So provincial representatives in the capital, who had to turn in certain sums to the crown each year, used the gold from tea sales for this purpose and wrote drafts entitling the merchants to collect their proceeds on their return to the provinces. It is nearly 400 years since tea was first enjoyed in Europe or almost anywhere else outside the immediate neighborhood of China, the original homeland of tea. In fact, tea had already been in use for more than 4,000 years before non-Asians got to take their first sip. This tea to which we Westerners were first introduced in the 1600s had been slowly evolving in the East. It began as a medicine and was later taken as a tonic. Starting about the time of Christ, its popularity as a beverage began to spread throughout China along with Buddhism, for the Buddhists are to tea in Asia what the Catholics are to wine in Europe and it is not entirely far-fetched to think of tea as Buddhist communion. The earliest tea was manufactured into cakes which are called tea bricks now and, to be brought to perfection as a drink, these required boiling, after other elaborate preparation. This is the form of tea described in the world's first tea book, the Cha Ching, written by a Buddhist-trained tea master named Lu Yu around 780 AD. Later on, cake tea was ground into a fine powder, which could be whipped in hot---not boiling---water with a split-bamboo tea whisk. The frothy liquid was then drunk with the tea particles suspended in it. This form of tea was copied by the Japanese and is perpetuated in the Japanese tea ceremony to this day. Only after 1300 did the Chinese discover how to manufacture tea in loose-leaf form, best prepared by steeping. This is the form of tea that the world knows today. All the various kinds of tea that have ever been developed continue to be produced and enjoyed in China, but loose leaf tea which is prepared by steeping, gradually seeped throughout the whole world to become mankind's most popular beverage except for water itself. The trade in tea, outside of China, has always been a business like no other. China was the source of the world's tea until well after 1839, when it was first produced in India by the British. During the centuries of the China monopoly, tea was handled by specialty purveyors like Twining, who set up business in London in 1715 with 18 different teas, priced and sold by type and quality, straight from the chest. Not until 1826 was the first packet tea - a guaranteed net-weight of blended tea in a container bearing a trademark and a retail price - introduced by the honest English Quaker, John Horniman. Things got changed in the mid-1800s when British had India produce the tea, which tea was entirely different from anything seen before. That was plantation-grown, machine-produced black tea derived not from the China-type tea plant but from the tea plant which had been discovered growing wild in India called Assam jat ("type"). Assam jat, like the colonial monoculture method of growing it and the industrialized Orthodox Manufacture method of producing it, eventually spread to every new tea-producing country around the world. By 1890, over half of England's tea came from India. Before long, colonial tea had replaced China tea decisively in the West as British, colonial-built industries took root in one new tea land after another, all producing black tea and nothing else. It was a uniform, standardized product ideal for packet tea blends and it could be mass-marketed more profitably than any other agricultural commodity. The mass marketing of this kind of tea is best exemplified by Thomas J. Lipton's worldwide brand, a success that has hardly been equaled since he bought his first Sri Lanka estates in 1890. Irish Breakfast tea comes from an Irish famous gourmand and a prolific author -- James Joyce. His protagonist, Leopold Bloom, recounted every meal consumed on what is now known as Bloomsday. The meal, including Fry, is typically served all day long, and consists primarily of porridge, bacon, sausage, smoked salmon, eggs and tea. The latter was required equally strong, as it was customary to dilute it with milk. Irish Breakfast consists of China Keemun Black, Ceylon and Assam were judged equal to the task and plays a powerful role. However, the proportion of each varies greatly from blend to blend. The tea is a full-bodied, malty brew. In Ireland, it is not referred to as "Irish Breakfast", but simply as "tea". Because Oolong teas (cha) are to produce a full-bodied beverage, their leaves must not be picked too early or at too tender a stage. They must be processed immediately after picked. Unlike leaves for green tea, those destined to be Oolong are wilted in direct sunlight. Then some types of Oolong are shaken in tubular bamboo baskets to bruise the leaf edges. This bruising is what makes the edges oxidize faster than the center. A typical example of this appearance is Ti Kuan Yin (Iron Goddess of Mercy). The fermentation is arrested halfway through by firing (semi-fermented). The less fermented, the more greenish they will be. Lapsang Souchong is spelled out by following Fukienese dialectic pronunciation, whereas Lapsang means "from high mountains" and Souchong means "sub-variety". According to popular mythology, the smoky flavor and process of this tea was purely discovered by accident. During Dao Guang era of Qing dynasty in ancient China, due to the local turmoil, a band of soldiers passed through ChongAn Star Village of Fujian and occupied a tea factory, which was filled with unprocessed fresh tea leaves. As such, the factory was disturbed to dry and to process those leaves on a timely base, so that the leaves turned into dark color with unexpected partial fermentation. When the soldiers left and the workers lit open fires of green pine wood to hasten the drying in an unusual way of processing. Beyond their predictions, the unique smoky flavor of Lapsang Souchong attracted the great interests of the Royal families in the United Kingdom. Not only did the tea catch the market in time, but the very strong odor of smoked pine flavor created a sensation! Another legend claimed that the tea was accidentally developed, when traders left packs of tea too close to the pine wood fire, resulting a thoroughly smoky flavor when the tea reached the market. On mentioning those legends of Lapsang Souchong, people may commonly connect it to Russian Caravan, which refers to the long, overland journey that tea would travel on from China to the markets in Moscow around 19th century. Those chests of tea would travel on camelback for almost a year. Russian-bound tea was famous for the smell of the many campfires it would absorb along the way. And thus, the smoky tea varieties became associated with Russia, and often have Czar Nikolai and other Slavic or Russian monarchy names. Keemun (QiMen or QiHong or Keemun Congou) tea are mainly produced from eight different types of tea bushes in AnHui and JiangXi provinces, China and the best of Keemun comes from leaves that have a little red vein running down the backside of the leaf. Until around a century ago, those regions produced only green tea, which was unremarkable at best. However, in 1875 the local farmers switched to the manufacture of black tea and the results were spectacular. Small, thin, slightly twisted leaves that are naturally sweet and refreshing characterize the style and flavor of the best Keemun tea. Believe or not, those tiny leaves are painstakingly hand-sorted both before and after processing. Keemun teas come in a wide range of quality, e.g. Hao Ya ("hairy bud" in English) is the highest grade and Keemun Mao Feng ("hairpoint" in English) is the next. Those two elegant teas can range from very dark black to black that is tinged with a soft, matte gray. You may see a shining golden ring circle at the liquor edge of cup after they have properly been brewed. Both are in very small quantity production, which makes them pricey, but always well worth it. Pu Erh tea gets its name from a small town located in southern Yunnan. Tea had been cultivated in this part of China for about four thousand years. Its popularity owes much to the many trade routes that flowed through this region. With popularity came royal inquiry. 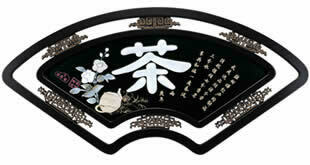 And so, Pu Erh teas have been offered in tribute to many a generation of Chinese emperors. It is among the few teas that improves with age in either raw or cooked versions of Pu-Erh tea. Similar to wine, one may find very expensive Pu Erhs that are decades old. "Slimming" is one of the properties the locals attribute to it. Recent studies seem to show there is some validity to this reputation. This tea's unique fermentation process imparts it with some cholesterol-fighting powers. It should be mentioned that the tea will have a better taste if it's been brewed with a higher temperature in our collectible pots. Yunnan Black Congou is a black tea from the province of Yunnan in the south west of China bordering Vietnam. Congou ("gong fu" in Chinese) refers to one of the highest grades of black teas. A term of black congou is meant to underscore a process or something that is time consumed, well produced, carefully made, labor intensive, well executed. This tea also requires extraordinary skills in all steps of their manufacture--from the plucking to the initial sorting to the manufacture and final sorting. 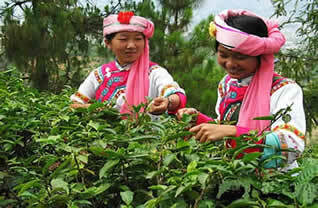 Yunnan had been a tea-producing region for close to two thousand years. Here grows China's oldest wild tea tree - about seventeen hundred years old. Yunnan's most senior cultivated tree is a relative youngster - a mere eight hundred years old. The place also has the distinction of producing more black tea with large-leaf types than any other part of China, although it's a relative newcomer to this variety. This black tea was first produced there at the end year of 1938, and is distinguished by its unique peppery taste. It was a news spread that the Queen of England flauntingly displayed this tea in a crystal glass during the Second World War. It is told that in the Ming Dynasty of ancient China, there was a farmer, called Uncle Zhao, in Su Zhou City having three sons and living in penury. 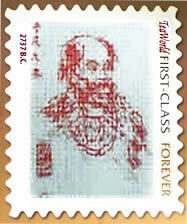 He had to go far away from his home to Canton of Southern China in order to make money and support his family. Two years later, he brought back a bundle of saplings, which were called “fragrant flowers” by that time. The saplings were planted next to tea bushes in the eldest son’s garden and were blooming with tiny white flowers. Surprisingly, the teas from that garden scented with its unique fragrance and went extremely well in the tea marketplace, from which the eldest son made astounding profits than his brothers could. The other two sons felt unbalance and fought with the eldest against their father’s favor. In the settlement, Uncle Zhao had to invite a respected old hermit, named “Dai Kui”, from their town to judge the case. By considering the family unity first and profit (pronounced ‘Li’ in Chinese) last (pronounced ‘Mo’ in Chinese), the hermit suggested to spread the eldest son’s profits for the tea sales and saplings among three of them. After hearing his judgment, Zhao’s family, including three sons, was persuaded completely. Actually, ‘Mo Li’ is currently referring to and translated into “Jasmine” in English. Since then, they united together and named the tea as “Mo Li” tea (Jasmine Tea), which means that selfish interests should be last. 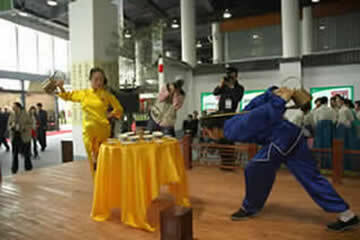 Now Jasmine tea implicates a sense of unity to bring up success in China. Golden Needle tea, the most superb black tea, hails from Wu Yi Mountains of the Fujian province in China, whereas the province is one of its most prolific in teas. This region accounts for one-fifth of China's total tea output. And the high quality of its teas keeps them in high demand. This region's exports of tea used to be accounted for a quarter of the country's total. Fujian teas benefits from an excellent climate, combining mild temperatures, abundant rainfall and mountainous terrain. This tea shapes like shiny golden needles with one leaf and one bud. It has a long history of cultivating tea over one-thousand years and has been stepping in to a organic category. --How much caffeine is in tea? Is it different for different types of tea? Caffeine levels vary with the type of tea, when it is picked, how it is processed, and most importantly, length of brewing time. While many sources state that black tea has the most caffeine and greens the least, it’s hard to rely on such generalizations, because so many variables affect the final caffeine content. Caffeine levels in a five-ounce cup of tea can range from six milligrams up to 110 milligrams per cup. The same amount of coffee yields 40 – 180 mg per cup. --What do OP and FOP mean in tea designations? In the tea grading system these designations are mainly used for whole leaf black teas and refer to the leaf size and amount of tip in the tea. OP, or Orange Pekoe, is a full-leaf black tea, whereas orange originally refers to the "prince of orange" and thus conveys tea of "noble quality", and whereas Pekoe means teas picked as two leaves and one bud. FOP, or Flowery Orange Pekoe, is not only a longer leaf than an OP but also has more buds. Grading systems and terminology vary with tea type and country. Generally, the more whole the leaf is and the more buds it contains, the higher the grade of tea. The typical examples we may indicate here from our listing are Keemun OP Quality and China Keemun Tea, which obviously the latter belongs to FOP. Pi Lo Chueng has been produced for over 1000 years. It is grown on the eastern banks of Dongting Lake of SuZhou, in Jiang Su (Jags) province, and so originally referred to by locals as Dongting tea. Later, it garnered the name "Astounding Fragrance." The name stuck. Given as a tribute tea in late Tang and early Song Dynasty periods, it was only when the Qing Dynasty Kang Xi Emperor tried it, while on southern tours of the empire, that it acquired the name, given by him, more befitting its imperious quality: Pi Lo Chueng, which translates literally from Chinese to Emerald Green (or Jade) Spiral Spring (or Green Snail Spring). Emerald Green is the color of the Eastern peaks of the Dongting mountains, in early morning. Spring because the tea is harvested in the Spring and the shape of the tea likes a tiny hair-covered spiral. Its leaf size is around 1/2 - 1 inch, hence one pound contains about 60,000 - 70,000 buds. The tea bushes are normally planted crosswise with loquat trees, from whence Pi Lo Chueng gets its unique fruit flavor. You could choose some of our black teas, e.g. China Keemun, Yunnan Black Congou or Keemun Mao Feng and normally two teaspoons of those teas per one cup. Fill a kattle with desired amount of fresh cold water and bring to a boil. Remove the kattle from the heat when water gets boiling. Let the desired tea steep for about 5-8 minutes and pour the tea into the pitcher straining the leaves. Add sweetener or sugar to the hot water if you prefer sweetened iced tea. Let the brew stand for another 2 minutes and then fill a glass pitcher up with ice cubes (half cup of ice per one cup of brewed tea). 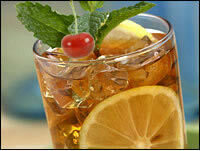 Pour the hot & steeped tea over the ice and add some slices of lemon or garnish to serve. When preparing fresh brewed iced tea, it is suggested to double the strength of hot tea since it will be poured over ice and diluted with cold water. 'Your tea will only be as good as your water', which has been addressed by many Tea Masters. Begin your brew by bringing filtered or spring water to a boil. Heat water to a rolling boil and then allow boiling water to cool for a moment to different temperatures depending on different types of teas, such as Black Tea, Green Tea, Oolong Tea and so on. Place certain amount of tea within a strainer or a infuser into your cup or our Yixing teapots (see suggested amount from our brewing tips) and pour hot water into your cup. Infuse for 3 to 6 minutes (see details from our brewing tips) or until you find the taste for your palate. Now sit back, sip and enjoy! Tea grading is normally based on the size of the leaf and types of leaves included in the tea. However leaf size is not, by itself, a guarantee of quality. The term cupping is to describe the tasting of different teas to determine quality, color, smell and taste. Cupping similar teas against each other will enable you to determine quality vs. price when making a purchase for your shop. There is no uniform grading system for green teas, but the better quality green consist of a leaf and a bud, then 2 leaves & a bud and so on. Traditionally, the eight criteria for good green tea are appearance, shape, color, completeness, aroma, liquor, flavor and wet leaf. All of those judgments need some kinds of experiences and expertises. To enjoy the full aroma and better taste of tea, we strongly recommend to use the same type of tea in the same pot, which means, green tea for one pot, black tea in other, Oolong tea in another and so on. The residual or mixed flavors of the different types of tea should not cross over into each other. Never clean the teapots with detergents or soaps, because they can be absorbed by the clay and affect the taste of the tea.